Work package 4 is devoted to the pushing the boundaries of state-of-art in Flood Forecasting and Early Warning Systems for Coastal Regions. 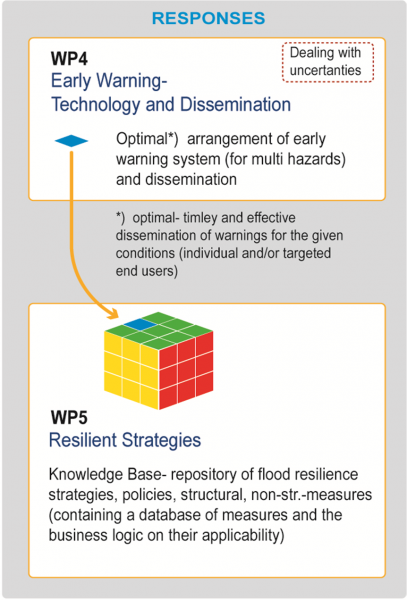 For that purpose, WP4 will develop and evaluate new methods for flood forecast and real time data assimilation for early warning, including: weather simulations, weather radar and river, urban drainage, sea field data measurements, coupled with probabilistic rainfall forecasts for extreme events. The project will also improve the speed of state-of-art modelling tools for early warning, in order to achieve sufficient lead times for emergency actions and further develop the use of emerging web technologies and real-time applications. Work will be undertaken to develop new, and customise existing methods and concepts for fast flood simulations in areas with combined flood risks, e.g. from coastal, fluvial and pluvial flooding and develop and evaluate methods for uncertainty propagation and its impacts on early warnings and real-time decision making. Furthermore, WP4 will advance and evaluate the linking between early warning service providers and decision makers’ command and control systems and improve both formal and informal dissemination of information from early warning systems. Last but not least, WP4 will apply and evaluate new paradigms and technologies based on smart devices for early warning. As such WP4 advances will contribute to the complete chain of early warning systems, from forecasts and data, to modelling and warning dissemination. These ideas are presented briefly next, within the context of the state-of-art. Improve the formal and informal dissemination of information from early warning systems at local regional, national and cross border scales. D 4.6 A generic, multi-language smartphone app. Llort X, Rafael Sánchez-Diezma, Álvaro Rodríguez, David Sancho, Marc Berenguer, Daniel Sempere-Torres, 2014: “FloodAlert: A Simplified Radar-Based EWS for Urban Flood Warning“. Proceedings of the 11th International Conference on Hydroinformatics, 17-21 August, 2014, New York. Rodríguez A, X Llort, D Sancho, R Sánchez-Diezma, R Bella, V Gómez, 2014: “Hidromet: A Cloud-Based EWS Platform for Real Time Urban Flood Warning“. Proceedings of the 11th International Conference on Hydroinformatics, 17-21 August, 2014, New York.